Wholistic Sound is a non-invasive blend of healing modalities using sound, music and frequency to restore balance and harmony to the physical, mental and emotional bodies. 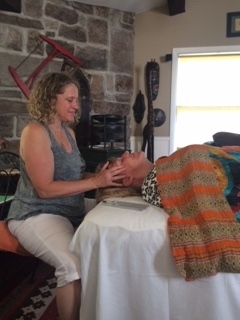 A typical session may include any of the following modalities: toning or overtone singing, VibroAcoustic Sound Therapy, energy healing bodywork, tuning forks, crystal or Himalayan singing bowls, craniosacral therapy. Each session is individually tailored to the unique needs and goals of the client. Sessions cost $100 and typically last for 75-100 minutes, however there is no time limit. A glimpse into my sound healing room and a sound therapy treatment on the Soundweaver, a vibroacoustic healing environment which combines a Somatron Body Mat with 4 speakers built into it contained within a copper dodecahedron for maximum balancing and integration. All the cells in the body are gently massaged with musical frequency while external Bose speakers provide surround sound and greater clarity.